Ibiza Town, actually a city, is the capital and largest town of the island of Ibiza, one of Spain's Balearic Islands. During summer it is home to thousands of tourists, that come to party in the discotheques at night, and relax at the beaches during the day. During the rest of the year it is still the most vibrant town on the island, but the visitors are of a different kind. 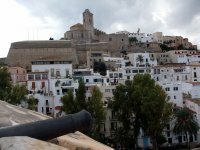 Dalt Vila is the old town of Ibiza Town, that lies within the old city walls and includes the citadel that towers high above the harbour. You can walk around on the many bastions, enjoying the view on the city, and towards the sea, and towards Formentera. Within the walls also lies the Cathedral of the city. Together with the hill on which the old windmills are located, this sight is labeled an Unesco World Heritage Site. Along the coast you will find a couple of beaches. South of the old town, the first one is Ses Figueretes, further south Playa d'en Bossa is popular as well. Only opened during the summer season, which last roughly from June until September, although some closing parties can be given in the first weekend of October in some years. Ibiza is know for having the best DJ's in the world performing on the island, and is home to some world famous discotheques. Names you will come across over and over again in the city, include Amnesia, Pacha, DC10 and Space. Most discotheques also have exclusive shops in town selling their merchandise. Ibiza Town has a typical Mediterranean climate with warm and dry summers and mild but relatively wet winters. Summers last from June to September when temperatures during the day average between 24 °C and 28 °C with nights generally still above 20 °C. Occasionally, temperatures can hit almost 40 °C. Winters last from December to February with temperatures around 13 °C or 14 °C and nights around 10 °C. This is also the time when most rain falls, although autumn and spring have a good deal of showers as well and even summers can have some heavy showers now and then. Ibiza Airport (IBZ) serves the island of Ibiza and is especially busy in summer. Many charter airlines and budget airlines like Ryanair use the airport. It is located about 7 kilometres from Ibiza Town. Busline 10 takes you to Ibiza town, with one way tickets costing €3.35. 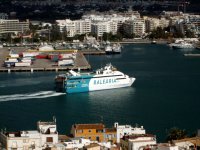 Cars can be taken on board of the ferries heading to Ibiza, leaving from several places at the Spanish mainland (see below). Acciona Trasmediterránea, Balearia and Iscomar have connections to the mainland (Barcelona and Valencia and other Balearic Islands. Renting a car is one of the best ways to cover a lot of the island and offers the possibility to visit some more remote places. Roads are generally in a good conditions and prices of rental cars are not too high. Book ahead during the peak months of July and August. There is also transportation by taxi, which in turn offer the possibility of guided tours of the island at low prices. At the Avinguda d'Isador Macabich, you will find the bus station. To be more precise it is a couple of stops on the northern side of the street in a row. Most busses leave at the top of the hour, and many as well at the bottom of the hour. In summer season the frequency is higher, and several buslines are added. 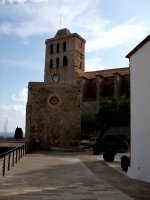 Ibiza Town is not a very big place, so walking is the best way to see the Town. Apart from the Dalt Vila, Ibiza Town is pretty flat. Bike lanes are not in place all over town, but getting around by bike is easier than in other Spanish cities. El Pirata - the best pizza on the island bar none! Located in the port of Ibiza Town. La Brasa - the best place for grilled meats, seafood, and other local specialities. We have a comprehensive list of accommodation in Ibiza Town searchable right here on Travellerspoint. You can use our map to quickly compare budget, mid-range or top of the range accommodation in Ibiza Town and areas nearby. This is version 19. Last edited at 3:41 on Aug 2, 17 by sleepBot. 7 articles link to this page.